Cave Beneath the Sea, Book 4 of my Shards of Excalibur young adult fantasy series from Coteau Books, officially released on November 15. I’ve been thrilled with all the covers of the Shards of Excalibur series, and I think you can see why, looking at Cave Beneath the Sea. All the books have looked fantastic, and I can’t wait to finish off the series in the spring with Door into Faerie, the climactic conclusion. 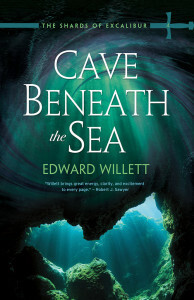 I had a great time writing Cave Beneath the Sea and I can’t wait for readers to experience it. It’s available directly from Coteau Books, or through Amazon.ca or Indigo, in both paperback and ebook formats.